So if motivation doesn’t last, what do you do to motivate yourself? 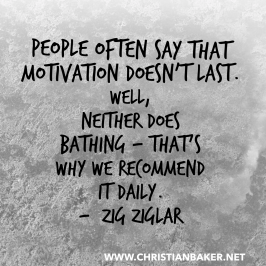 What can you do daily to motivate yourself? The things that we do, the TV we watch, the music we listen to, the things we read, the company we keep, the pastimes we engage in, either drain us, or Radiate us. Is it time you spent more time doing the things that radiate and motivate you. What to I need to stop doing? Now put it into action and make it happen!